The Wooten sisters – R’Reanna, A’Avryanna, and I’Ivryanna – are as unique as their names. R’Reanna may seem quiet, but reveals honesty and thoughtful insight once trust is established. A’Avryanna is a blend of sassy and sweet; quick to laugh and eager to speak. I’Ivryanna is equally as bubbly, but with a touch of sensitivity and gentleness. The three sisters do have two things in common: they all love each other deeply and visibly, and they each have a mentor through Mercy Street. The Wootens live in West Dallas with their grandmother and puppy and attend the local schools of Martinez Learning Center and Heights Primary. The girls describe their home as “safe” – a place where they feel protected from harm, can watch movies and do homework together, and where their mentors are always welcome. “She is so, so sweet!” 10-year-old I’Ivryanna says with an affectionate grin about her mentor, Savannah Brock. Not only is Savannah sweet, but she is deeply passionate about the West Dallas community and incarnational living, which she practices by residing in a neighborhood that is back-to-back with the apartment complex where the Wootens live. Savannah became involved in the community several years ago and felt convicted about not being able to identify with residents’ problems or struggles. She explains, “If these are the people I am called to care for, how can I care for them unless I know them?” This idea prompted her to move into a West Dallas neighborhood, where she now can see I’Ivryanna on a regular basis and engage in life-on-life activities such as walking to I’vryanna’s school with her to meet her teachers and having I’vryanna and her family over to make breakfast. In her own childhood, Michelle often wished for a mentor and even wrote in her diary that she wished she had someone to guide her. She struggled in her teen years with depression and acting out, and identifies one of the key factors to a mentoring relationship as consistency. “It’s that steadfast presence,” she observes. “If I say I’m going to pick her up on this day, then I’m going to pick her up on this day. Consistently following through builds trust.” Michelle and A’Avryanna go on a number of adventures together, such as bowling, visiting the Crayola Experience, and eating ice cream. However, A’Avryanna continues to declare that her favorite time she spent with Michelle was when they baked a cake at Michelle’s house – simply chatting and doing a simple task together in Michelle’s space is a memory that A’Avryanna will treasure forever. Roxanne Alanis has been mentoring R’Reanna, the oldest sister at 12 years old, for nearly a year. Roxanne is one to capture your attention, with a big smile and even bigger personality. She shares that she grew up in an unchurched home in East Chicago, surrounded by the influence of substance abuse and a broken home. She had issues with school authority, noting with a laugh that she practically lived in the principal’s office. 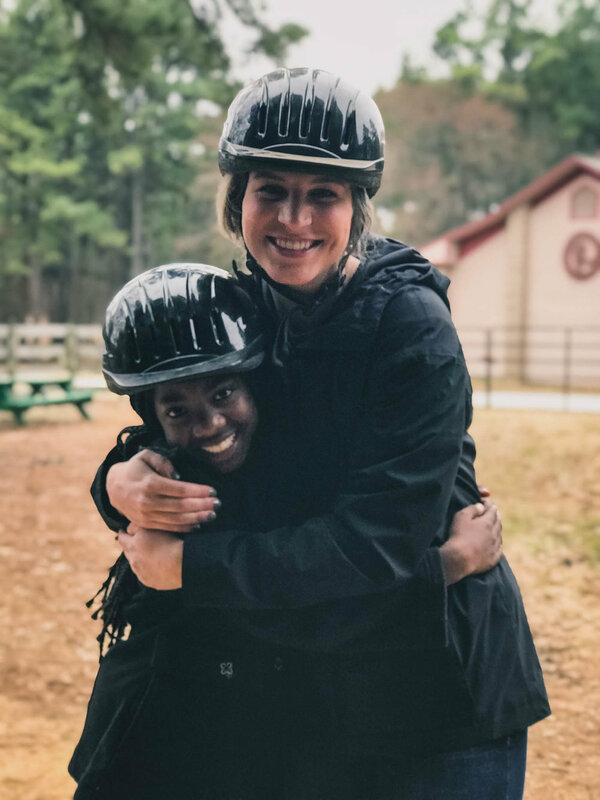 Recently, Roxanne has been able to relate to R’Reanna’s own troubles in school, viewing it as an opportunity to discuss patience and emotional intelligence. R’Reanna, her mentee, reiterates that she learned about patience by reading the Bible with Roxanne. Roxanne invites R’Reanna to participate in all aspects of her life, whether it’s attending Roxanne’s nephew’s birthday party or riding on a boat with her friends. In the beginning of her relationship with R’Reanna she was discouraged by the quietness she received, but explains beautifully: “All those moments together, I feel like she was quietly observing and developing trust. That’s how I feel like God is with me; He patiently waits for me.” Roxanne expresses her compassion for women and for people you might not normally find in a church. “I have a heart to go out in the trenches,” she explains. “I can show you Christ by hanging out with you. It would be cool if someone would have done that for me.” Roxanne is currently studying Biblical Counseling at Dallas Theological Seminary, with the hope of counseling young women one day. Since the beginning of Mercy Street, it has been our dream to match every child in West Dallas with a mentor. With 21% of the community’s population being under 18, we have built relationships with five local public and charter schools and are actively engaging students to become mentees. That being said, we are always in need of humble, Christ-following mentors! Mentoring is a mutually-transforming process, and mentors should expect to have their world view and priorities transformed through loving and learning from their mentee. If you think the Lord may be calling you to invest in the life of a child, please visit www.mercystreetdallas.org/mentoring to learn more.